In a country obsessed with its weather, the British were secretly delighted by the Big Freeze in December, which provided an excuse to talk endlessly about snow and ice and sub-Arctic temperatures. 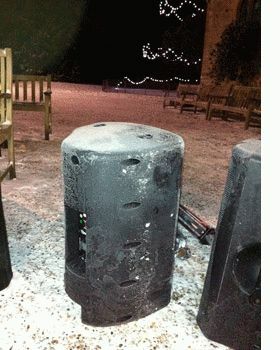 Down at Wakehurst Place, the country estate of Kew’s Royal Botanic Gardens, it was touch-and-go for Show Hire’s Nick Chubb and his EV ZX3 system – would both of them survive an outdoor concert in -7°C? Wakehurst Place, the National Trust’s most visited property, is famed for its festive Carols which usually attract 3,000 people to a service in front of the largest Christmas tree in the UK. For Nick Chubb, the first alarm bells rang when he had to push his van the last few yards of a 40-mile journey that had taken nearly 5 hours!